The Yale School of Drama (also known as YSD) is a graduate professional school of Yale University located in New Haven, Connecticut. Founded in 1924 as the Department of Drama in the School of Fine Arts, the school provides training in every discipline of the theatre: acting, design (set design, costume design, lighting design, projection design, and sound design), directing, dramaturgy and dramatic criticism, playwriting, stage management, technical design and production, and theatre management. The school operates in partnership with the Yale Repertory Theatre, also located in New Haven. The school traces its roots to the Yale Dramatic Association, the second-oldest college theatre association in the US, founded in 1900. The "Dramat" produced the American premieres of Albert Camus's Caligula and Shakespeare's Troilus and Cressida, as well as original works by Cole Porter, Stephen Vincent Benet, and Thornton Wilder written when they were students. This dramatic tradition led to the provision of funds in 1924 by Yale benefactor Edward S. Harkness to establish the Department of Drama in the School of Fine Arts and for the construction of the University Theatre, designed by Clarence H. Blackall and then later renovated by James Gamble Rogers in 1931. George Pierce Baker, a teacher of playwriting, was the first chairman of the department. The first class of students was enrolled in 1925 while the University Theatre was under construction and the first Master of Fine Arts in Drama was granted in 1931. In 1955, by vote of the Yale Corporation, the department was organized as a separate professional school, the first such in the Ivy League. In 1966, under Dean Robert Brustein, the Yale Repertory Theatre was formed to establish further ties between the professional and academic communities. Lloyd Richards, dean and artistic director from 1979 to 1991, increased the theatre's emphasis on new plays, premiering works by Athol Fugard, Lee Blessing, and August Wilson. Richards' successor as dean and artistic director, Stan Wojewodski, Jr. continued to emphasize the production of new plays, including several important works by Suzan-Lori Parks and Theatre de la Jeune Lune. The current dean and artistic director, James Bundy, has produced notable premieres by David Rabe, Jose Rivera, David Adjmi, and Sarah Ruhl, among others, as well as Radio Golf, the tenth play in August Wilson's 20th century cycle. A variety of locations on the Yale University campus serve the School of Drama. The University Theatre is a proscenium theatre that is shared with the undergraduate dramatic association and also houses the school's main administrative offices. 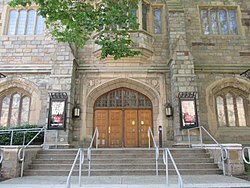 The Yale Repertory Theatre is located in the former building of the Calvary Baptist Church and contains an auditorium facing a modified apron stage as well as the Yale School of Drama/Yale Repertory Theatre box office. Additional facilities include the Iseman theatre in Holcombe T. Green, Jr. Hall, the School of Drama Annex, and the Robert B. Haas Family Arts Library. Admission to the Yale School of Drama is highly competitive. The Yale Herald reported that the school received 1,270 applications for the class of 1999 and admitted 68 applicants for an acceptance rate of 5.4%. The cost of tuition for the 2016-17 academic year was $29,750. James Bundy made improving financial aid for students a priority since his appointment as dean in 2002, and under his tenure, the school's financial aid budget grew from $1.4 million to over $6.1 million in 2017. Financial aid is awarded on the basis of financial need, with awards consisting of a combination of work-study employment, an educational loan, a tuition scholarship, and a living stipend. As of 2016, the average student with demonstrated financial need receives aid providing for 82 percent of the total cost of attendance. As of fall 2015, there were 194 students enrolled at the Yale School of Drama, 18% of which were international students. The School of Drama offers a Master of Fine Arts in acting, design, sound design, directing, dramaturgy and dramatic criticism, playwriting, stage management, technical design and production, and theatre management. Students must hold an undergraduate degree and complete their program of study with distinction, which requires three years in residence. The school also offers a Doctor of Fine Arts to students who hold an M.F.A. degree in Dramaturgy and Dramatic Criticism and have written a dissertation approved by the D.F.A. committee. A Certificate in Drama is available to those students who do not hold an undergraduate degree from an accredited college, but who are admitted and complete the same training as M.F.A. students. A Technical Internship Certificate is available to students who complete a one-year internship program of the Technical Design and Production department. The Yale School of Drama has emerged as one of the nation's best theatre conservatories. Founded in 1968, the Yale Cabaret is an entirely student-run extracurricular activity that allows students to create productions of their own. It is the only production opportunity at the school that allows students to work outside of their discipline. Patricia Clarkson, Tony Shalhoub, Kate Burton, David Alan Grier, Christopher Durang, and Wendy Wasserstein, among countless others, all performed at the Cabaret." Faculty members at the Yale School of Drama are working professionals in their fields, and in many cases, graduates of the school themselves. As of fall 2015, there are 79 faculty members. James Bundy is the current dean of the school as well as the artistic director of Yale Repertory Theatre. Current faculty members in the Acting department include Gregory Berger-Sobeck, Peter Francis James, and Walton Wilson, who also serves as chair of the department. Current faculty members in the Directing department include Emily Coates, Yuri Kordonsky, Robert Woodruff, and department chair Liz Diamond. Designers include Jane Greenwood, Jess Goldstein, and Jennifer Tipton. Playwrights include John Guare, Michael Korie, Lisa Kron, Tina Landau, Richard Nelson, Lynn Nottage, Peter Parnell, Adam Rapp, Paula Vogel, and Derek Walcott. Critics include Allardyce Nicoll. Music consultants include Rusty Magee. Former faculty includes dancer/choreographer Carmen de Lavallade, set designer Ming Cho Lee, actor Earle Gister and directors Robert Brustein, F. Curtis Canfield, Keith Fowler, and Nikos Psacharopoulos. Alumni of the Yale School of Drama are among the most distinguished in stage, film, television, and other creative fields. ^ a b c "History and Facilities". Yale School of Drama. Yale University. ^ Peiffer, Siobhan (1996-10-04). "Backstage at Yale Drama admissions". Yale Herald. ^ "Tuition". Yale School of Drama. Yale University. ^ Akbar, Ahmed (2012-02-15). "Drama applications continue 3-year high". Yale Daily News. ^ a b "Financial Aid Policy". Yale School of Drama. Yale University. ^ a b "Yale Facts". About Yale. Yale University. 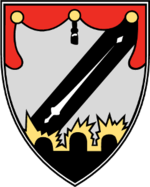 ^ "Degrees and Certificates". Yale School of Drama. Yale Publisher. ^ McKinley, Jesse (2002-04-07). "At Yale Drama, Actors Learn The Play Is The Last Thing". The New York Times. ^ Gerard, Jeremy (1988-04-19). "Juilliard Drama School, at 20, Stresses Versatility". The New York Times. ^ a b Smart, Jack (2016-03-11). "The Inside Scoop on Yale's Acting MFA". Backstage. ^ "Training at Yale School of Drama". Yale School of Drama. Yale University. ^ Hawes, Peter. "A New Dean Takes the Stage". Yale Alumni Magazine. ^ "James Bundy". Yale School of Drama. Yale University. ^ "Yale School of Drama/Yale Repertory Theatre Administration and Faculty". Yale School of Drama. Yale University. ^ "Alumni of the Yale School of Drama".